Welcome to Your Sewing Center! Your Sewing Center is your source for the best sewing products and services in Waterloo and surrounding areas. We provide the top brands along with expert assistance for finding what you need. Our trained staff also provides help with your current projects. Customer satisfaction is our #1 priority. Choose from our diverse selection of quality sewing and embroidery machines from Brother. These machines have features and options you have to see to appreciate. The V Series machines with laser light and sensor pens for accuracy are beyond belief. The machines also have bigger needle-to-arm space for those of you who like to machine quilt. Have us do the cutting for you using the Accuquilt Studio cutter. All you have to do is bring in your fabric and pattern and we can get you to the fun part of piecing! We have some great new Accuquilt dies just waiting for you to try. Accuquilt gives you the piecing and applique precision you are looking for. It is also great for "rag" quilts. Come see the possibilities you can create by turning and rearranging the pieces from just one or two dies. Not ready to purchase the cutter yet? We have the option for you to rent ours for $10 per project and you can do all your cutting here in the store. So come right in, you'll love the results! 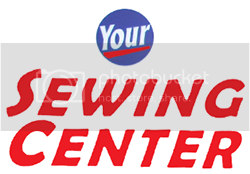 Your Sewing Center is located at 1010 Alabar Ave, Waterloo, IA 50701. For more information call us at 319-242-4338. You can also reach us by email at: yoursc@mediacombb.net. For updates, sales, and events be sure to visit our website, like us on Facebook, and follow us on Twitter. We look forward to helping you meet your sewing needs soon!